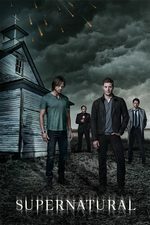 Sam and Dean investigate a series of murders at a local B&B that also happens to be Lizzie Borden's old home. When a man tells them he saw a little girl around the B&B around the time of the murders, the brothers realize Amara may be responsible. The broader discussion of being soulless in this episode really appealed to me. From what Sam went through, to how Jenna and Sydney reacted vs how Len reacted, I can't help but wonder how I would react. Also, Sam mentioned that Dean knows what it's like too, does he mean when Dean was a demon? Demons still have a soul, don't they? They're just evil souls, right? Amara can feed on demons and souls. When Castiel was seeking power a few seasons back he seemed to be able to absorb demons as well. They are souls twisted by the torture of Hell into something unrecognizable. But presumably still souls. It was interesting to see different responses to being soulless. Not everyone instantly turns to a cold blooded killer. I've seen discussion in other places about whether Dean is fully back to himself this season. Could he possibly be soulless? He is a little colder than usual, but I tend to think that's just a response to his experiences with the Mark. My impression is that demons do have souls (albeit dark and twisted)...I think that's pretty much *all* they are actually, inside whatever host "meat-suit" they're in at the time (since unlike Dean last season, most don't remain in their original bodies). When Sam was soulless, it actually seemed to disturb some of the creatures he ran into when they peered inside. It was interesting to see the different reactions from Len and Sydney. Guess the reaction might depend on how damaged your sould already is by your life experiences. Len was a really fun character. I felt bad for Len, and his fate seemed really sad and unfair. He killed the babysitter to save the brothers, and even if he didn't feel remorse he hadn't done anything (yet) to merit life imprisonment or the chair. I found myself thinking that if they could lock him up where he couldn't act on his worst instincts, maybe his soul could be restored and he could get on with life as a normal person again. I get the impression that having no soul mostly frees you to act on things you've been repressing. Sam (who is a very caring, charitable guy but has a frustrated martyr side) became a total sociopath, reveling in finally acting selfishly. The babysitter became a killer, but she still had this desire to save the kid from his parents. (Why would somebody with no soul care about giving a kid a better life? She had those instincts as a normal person, and losing her soul made her act on them even if deep down she didn't care about the kid anymore either.) Len was presumably a rather innocent, sweet guy, and having no soul left him adrift but he had no raging, suppressed id to act on. But he did seem upset to not feel remorse for killing the babysitter, which is sort of confusing. Doesn't it take some goodness to worry that you're not good? Did anybody else get a little creeped out when the babysitter compared touching Amara's hand to chocolate cake and orgasms? I mean, it was obviously some kind of magical bliss thing and we could see it on her face, but her saying that kind of crossed a line for me. If Len had described meeting Amara like that it would have sounded SO gross and wrong. Putting the line in the mouth of the babysitter made it sound less creepy, but I was still surprised to hear it on the show. It didn't ruin the episode, but it did briefly stop the story cold for me while I went, "Wait, WTF, show?". I enjoyed the episode, but man. I already knew, on an intellectual level, that the whole show is filmed in Vancouver, and that the writers treat literally every location in the US as being A Small-to-Medium-Sized Midwestern Town regardless of what spot on the map the writers hit with a dart that week. But it still always bothers me to have it set someplace near where I live or that I've actually spent time in. Let me tell ya: real-life Fall River is nothing like A Small-to-Medium-Sized Midwestern Town. So that ended up being kind of distracting for me, especially every time they talked to that very Midwestern-sounding cop. I really do wish they'd make at least a token effort to differentiate one place from another, especially when, as in this episode, there's a specific reason for that particular choice of location, rather than the usual darts-at-a-map method. But he did seem upset to not feel remorse for killing the babysitter, which is sort of confusing. Doesn't it take some goodness to worry that you're not good? I think you can be intellectually upset ("I am aware that this thing was supposed to occur, and it didn't, this is potentially problematic") without being emotionally invested either way, which was sort of the read I got on Len - it fit with his whole detached attitude about his entire life. In other words, you apparently don't have to be good, you just need to understand the concept of goodness. I related this back to what it was like when I was in a deep depression. Things would happen or I would do thing and I would intellectually know it was good or what I needed to do to be good but I wouldn't feel it. I know I should feel sad about what happen to you and will go through the motions of what I would normally do to comfort or help but really I don't care. Not a pleasant place to be in. This was actually one of the things that made me realize just how bad it had gotten.